ROAD TOWN, Tortola, VI – This news site's sources within the law enforcement community have confirmed that two men residing in the Virgin Islands have been held in custody in Puerto Rico for being caught allegedly with some 216 grams of cocaine near Haiti. One of the men is said to be a resident of West End while the other is from the sister island of Jost Van Dyke. While this news site has been furnished with the names of the two, and despite the fact that it has been confirmed by our sources, it has not been made clear whether or not they have been formally charged yet. 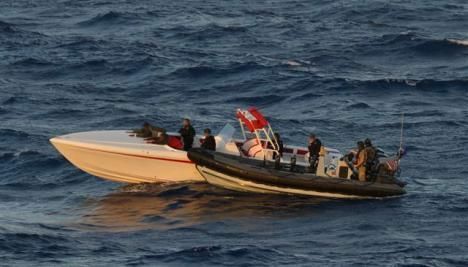 According to the information received, Coast Guard Law Enforcement Detachment Team (LEDT) and crew of the Argyll teamed up to seize 216 kilograms of cocaine worth an estimated wholesale value of $7.1 million after a Dutch maritime patrol aircraft detected a suspect go-fast and vectored the Argyll to the vessel's location on November 23, 2014. This was also reported on Caribbean News Now but the men's names were also not mentioned. The go-fast vessel was stopped and two suspects were taken into custody. The contraband was offloaded in Mayaguez, Puerto Rico, on Tuesday November 25, 2014. The two detained are said to be 'local boys'. They will do hard time alrigth, in prison. People decide to throw their lives away by transporting drugs, their decision mind you, and some how it's the government's fault??? You CANNOT blame the government for people's nonsensical actions and behavior. All the way out there? What length people won't go to live the big life, even if it mean hanging their mothers by their breasts. Pathetic. Their a$$s should have been fed to the sharks. Sorry, this is how I feel. Drugs ruin the lives of many of my family and friends, and I can't have sympathy for drug dealers. All of us see some one who we know suffer and decline from the ravage of the drug scourge, but we turn a blind eye and idolize the glitter and glam of the perpetrators. So Sad as a People. You all can't wait until they get charged to know they names??? I know both men but not saying a word. Them West man have a totally different mind-set from the rest of the island/territory; seems like. It's always somebody from down there in relation to all these drug busts, SMH. Historically as well... Since the late 80's, early 90's. cash flow is a must.....west side!!!!!! You sir is telling the TRUTH! Them boy really stop ?! I know they had more gas than that dingy! WAY more! They was suppose to turn the bow East and keep it moving, full throttle. But til Haiti thou ?! The satelite shut the 3 engines down. You forget they can blow the engines from the air? Dem home boyz up on the bow kneading down and praying. Thankfully they were caught outside the BVI which means they will likely get the sentence they deserve rather than a slap on the wrist. Glad they didn't manage to bring their nasty drugs here or anywhere for that matter. I've seen that boat around the west end for quite some time now. I don't know the fellow who owns it but all I can say is that I am not in the least bit surprised. Some people just don't know when to quit! they actual know when to quit but they just think de brain bigger than the average man on this here earth!!!!!! According to the Coast Guard, the 216 kilograms of cocaine recovered from Operation "Martillo" is valued at THIRTY FIVE MILLION DOLLARS! This is what happens when you don't read and understand, comprehension is key. The operation "Martillio" recovered a total of 35 million for the entire operation. They are only 7.1 million, the other bust was 27.9 million. Do the damn math!!! They never mentioned where boat was apprehended .U.S. coast guard news.Readers are combining two different bust by same coast guard boat . A mother must train up a child in the way it should grow,but she's to greedy.See what she did to her child life,and I'm not upset you upset the game is over. all i have to say; the virgin islands is now filled with undercover DEA not only undercover DEA a number of guys informing(RATS)...droping the dime now pays big-money....the same person the guys buying the dope from are DEA or them getting set-up!!!!!! You sir is telling the truth! The same man dem ayo celebrate in the streets who been doing deal but never got arrested you never wondered why? With their bikes and car up and down talking bout they don' deal like that no more? From Huntums Gut to else where they don't have to sell like that cause their main job is SNITVHING OUT EVEYBODY ELSE. Drugs 4 life f the police!! !